This monograph attempts at an exploration of Indian psyche at folk level which finds its expression in poetic form known as Barahmasa-songs the twelve months. A part of the oral tradition of Indian literature and composed mainly by village women, the popularity o these songs with North Indian village folks remains as lively as ever in spite of rapid progress of urbanization. In Part One the author makes a penetrating analysis of the essential core of Barahmasa literature that occupies a distinguished position in Indo-Aryan vernaculars. Different types of Barahmasas, their origin and development, are brought under purview of discussion. 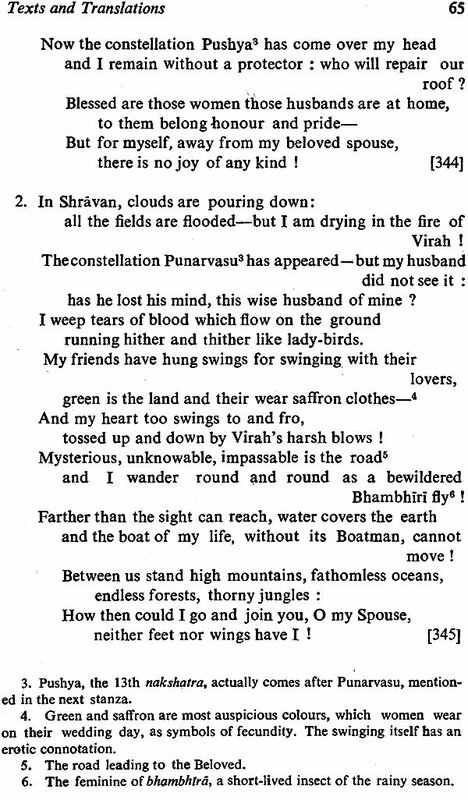 Central to the corpus of Barahmasa literature is the Viraha type which revolves around the theme of painful separation of the beloved from her lover. The Viraha type, symbolizing the pangs of the human soul for divine love, is cultivated by Indian Sufis and Saints, and turned into a type known as 'Religious' Barahmasa. 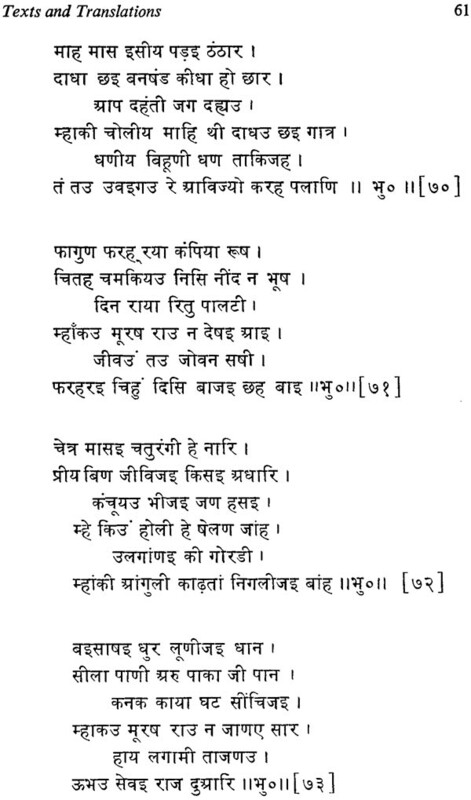 Part Two provides a selection of Barahmasa texts from Indian literary sources in Devanagari script, accompanied by their English translation. The monograph is a pioneering scholarly work on an untapped recess of Indian psyche. Written in a simple racy style, it appeals equally to researchers and general readers. Charlotte Vaudeville (b. 1918) graduated in classics (French, Latin and Greek) from the Sorbonne in 1939. She studied Sanskrit with Professor Renou. She also studied Hindi and Tamil in the Ecole des Languages Orientales in Paris. She visited India and researched on Indian vernacular literature. Charlotte Vaudeville is on the teaching staff of the Sorbonne, and is a member of the following learned societies : Royal Asiatic Society and the American Oriental Society. She is a prolific writer and has written innumerable scholarly articles, and twenty books in French and in English. The barahmasa is the song of the twelve months of the year and therefore of everyday life; the cognatic caumasa is the song of the four months of the rainy season which revives life after the searing summer and produces among separated lovers the longing for reunion. These songs are a well-known and well—beloved component of folk culture all over north India, from Bengal in the east, to Gujarat in the west. They are simple rustic songs describing the cycle and moods of the seasons, but doing so in terms of deep personal feelings, whether these be associated with foods and drinks, the agricultural cycle, the observance of religious festivals, or the experience of the agonized longing of the wife for reunion with her lover-husband. If one listens to these songs carefully, with the bent ear, as it were, they may perhaps provide insights into the structure and significance of lived experience in the Indian setting. 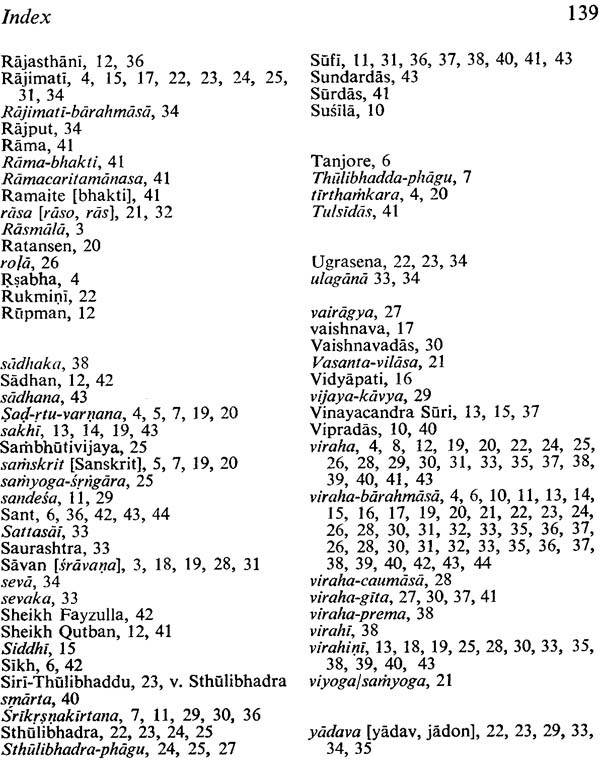 Thus, the barahmasa (and caumasa) may offer a clue to what is considered by many ‘outsiders’ a paradoxical aspect of Hindu culture: namely, the combination of an obsessive preoccupation with the flux of time—the almanac has been traditionally the most widely consulted guide to action in India—with a puzzling indifference to linear time as measured by clocks and recorded in historical calendars. As is well known, many western scholars have expressed dismay at what they consider the indifference of the Hindus (who are credited with some contributions to the cultural heritage of mankind) to the historical event—to exactitude in chronology. In everyday life today this indifference finds expression in a notorious disregard for the value of time. Punctuality proclaims modern man’s willingness to submit himself to, the control (even tyranny) of time as a key source of order in society given externally (socially or naturally). The watch that one wears on the wrist (or breast) is the magical gadget without which there will be chaos. But then it is also a manacle that- binds one in a manner the almanac never does. Legend has it that the great Mughal emperor Akbar accepted the courtesies and most of the gifts presented to him by a couple of Catholic priests-the first Europeans he had met—on behalf of Portuguese merchants, but among the few things he rejected was a clock! But who would say Akbar was not wise? It would not be an exaggeration to say that for Indians generally the significance of time has traditionally lain in personal experience: what could be longer in duration than the separation from one’s lover, or slower in coming than the next kumbha? When it is so conceived time may not be measured by clocks but in diverse other ways, such as by calculating the movements of heavenly bodies, awaiting the predictably uncertain rains, or watching the ripening of golden grain. There are obviously many ways of reckoning time in human cultures, and the barahmasa is one such reckoner. In fact, it goes beyond mere reckoning: it makes time bearable. I had heard the barahmasa mentioned, and had even listened to snatches of some songs, but the first scholarly discussion of this genre that I read was an article by Susan Wadley, a Syracuse University anthropologist (which later appeared in Contributions to Indian Sociology in 1983). Wadley had cited Charlotte Vaudeville’s monograph Barahmasa (1965), and when Frederique Marglin, another anthropologist (from Smith College), mentioned it to me in 1982 as a work that ought to be translated into English, I was mentally prepared for the suggestion. I was able to discuss if with Professor Vaudeville herself, and she promised her cooperation, offering to re-translate the songs from the original Indian languages (Avadhi, Braj, Rajasthani, Gujarati, Marathi, Bengali) into English, rather than from the French translations prepared by her earlier. ‘Translating from a translation’, she said, ‘yields poor results she did not have the time, however, to write a new introduction or translate the old one. The help of a professional translator was required for this purpose and I turned to Mr. Clemens Heller, Administreteur adjoint, Foundation de La Maison des Sciences de l’Homme. His response was characteristically generous. Thus assured of a text, I approached for Mr. Narendra Prakash Jain (of Motilal Banarsidass, the well-known publishers of indological works), and he agreed to undertake the production and publication of the book. Subsequently, Professor Vaudeville entrusted the translation of the introductory essay to Ms. Heather Willings who prepared it in consultation with the author. It is a pleasure to record here the cooperation of all these persons in making it possible to bring out this English edition of barahmasa which should have a wide readership in India and abroad. My task as the writer of the Foreword is done. I will not be so presumptuous as to suggest that the distinguished author of this monograph, Professor Charlotte Vaudeville (who is a familiar, friendly and esteemed colleague of Indianists, not only in Paris, where she is a professor at the Ecole Pratique des Hautes Etudes, but also in such far-Hung places of learning as Banaras Hindu University, Cambridge University, Chicago University, Harvard University, Poona University, and the University of California at Berkeley) needs any introduction. It is a pleasure, however, to acknowledge here the indebtedness of Indians and Indianists to her for her monumental work on Kabir and for her other numerous publications based on Indian folklore and vernacular literatures of modern India. The present book is a revised and somewhat enlarged English version of a work first written in French and published in 1965. My first work on the "Barahmasa" genre was born from a growing awareness of the extraordinary richness and intrinsic value of the folk-songs composed in various Indo-Aryan vernaculars, some of which did not even have any written literature to boast about. The early Western Indologists, on the whole, were mostly attracted to the ancient literatures of India, composed in Sanskrit or Prakrit, which were the vehicle of the so—called "Great Tradition". Folk literature as a whole, especially village songs, remained beyond the pale as far as Indology was concerned. Such was also the case with Indian scholars trained in the methods of Western scholarship. The first attempt at editing and translating some Indian village songs was made in 1871 by C. E. GROVER who preceded by a few years the great Linguist and Indologist George GRIERSON, whose Bhojpuri folk—songs were published in 1887. As editor and translator of folk-songs, Grierson found followers in A. G. SHIREFF, Sarat Chandra MITRA°" and Dinesh Chandra SEN. From 1944 onwards a new impetus was given by VERRIER- ELWIN,’ ‘followed by S. C. DUBEY and W. G. ARCHER? All those early works were published in English: they included English translations from the vernaculars, but usually did not give the text. For the last thirty years or so, those pioneers have been relieved by a new generation of Indian scholars, who set about collecting folk-songs composed all over Northern India in various Indo-Aryan dialects. Their books were mostly published in Hindi, and included the songs in the original dialect, with a Hindi paraphrase. 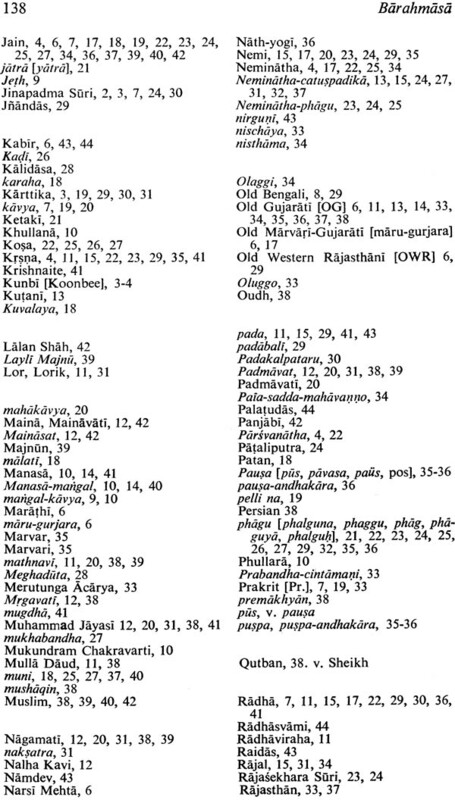 Collections of folk-songs were published inter alia by Devilal Sharma for Rajasthani, Induprakash Pande for Avadhi, Tej Narayan Lal for Maithili, Shyam Parmar for Malavi. The most prominent and most prolific among the new wave of Indian folklorists was Krishnadev Upadhyay, a scholar from Ballia in the heart of the Bhojpuri area, who took up the task of revealing the treasure of the Bhojpuri folk-songs: he collected about a thousand of them and published them in two volumes, with a Hindi translation. The same scholar was also the author of other works dealing with the tradition of folk- songs and folk literature especially a study on "The background of Folk Literature", which included a precious bibliography listing the folk-songs edited in fifteen languages and dialects of Northern India up to 1957. All the collections of folk-songs composed in the various languages and dialects of Northern India include a comparatively large number of so—called BERAHMESA, "Songs of the Twelve Months". Nearly all of them belong to the "Viraha-Barahmasa" type, on the theme of the pain of separation (vimha) endured by a young wife pining for the return of her beloved all through the twelve months of the year. In such songs, the description of nature is intimately and attractively joined to the expression of the heroine’s sorrow. Such songs are essentially women’s songs and must have been composed by village women. In their songs, the four months of the rainy season are given more importance than the other months of the year: the season of love and intimacy par excellence being also the most painful trial for the loving wife separated from her mate. 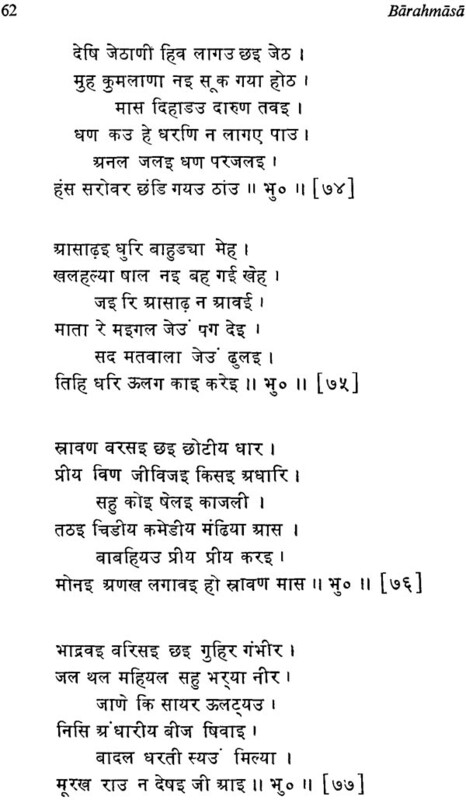 So great are the charm and pathos of those songs and so powerful their appeal to Indian sensibility that the Barahmasa folk-song soon became a literary "genre": actually, a good many Barahmasas were composed by male poets—usually rural poets —and are being composed to this day. Most of those poems are muktaka, i.e. "independent" poems, with the male composer’s name introduced in the last line in the traditional fashion, while the female poets remain for ever anonymous. But in all cases the Viraha Barahmasa is placed in the mouth of a "virahini", a woman tormented by the absence of her lord. 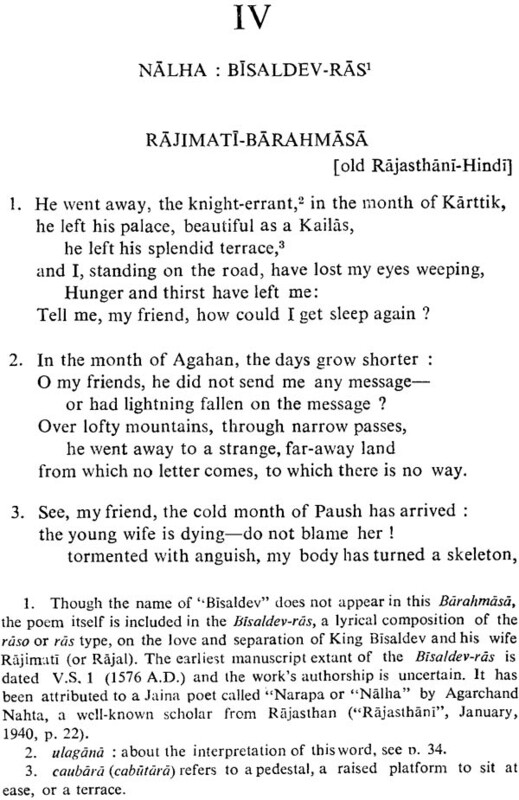 A number of verses borrowed from village Barahmasas are found included in the ancient Rajasthani ballad known as Dhola-maru-ra duha:: in that famous legend, which has inspired so many miniature paintings in Rajasthan, both the heroines in turn appear as pathetic "virahinis", pining for their common husband, Dhola. 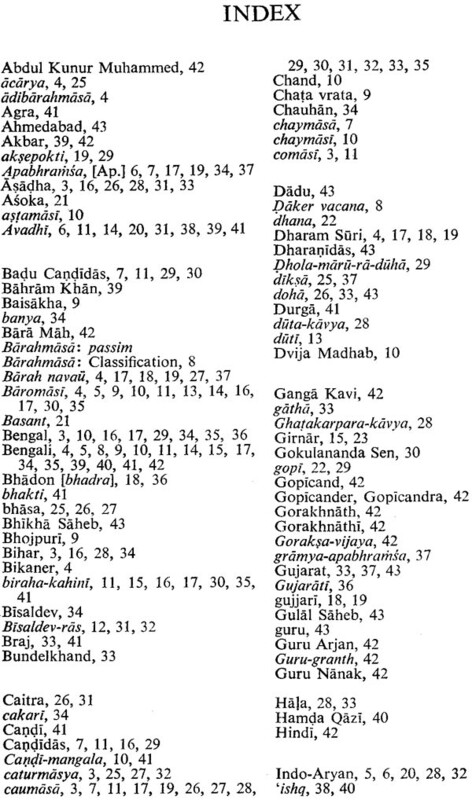 Other Barahmasas, mostly of the "didactic" type, are found inserted in the folk epics (also known as "folk- mahakavyas") composed in medieval times by Hindu as well as Muslim poets. This is specially the case with the mangal literature of Medieval Bengal. 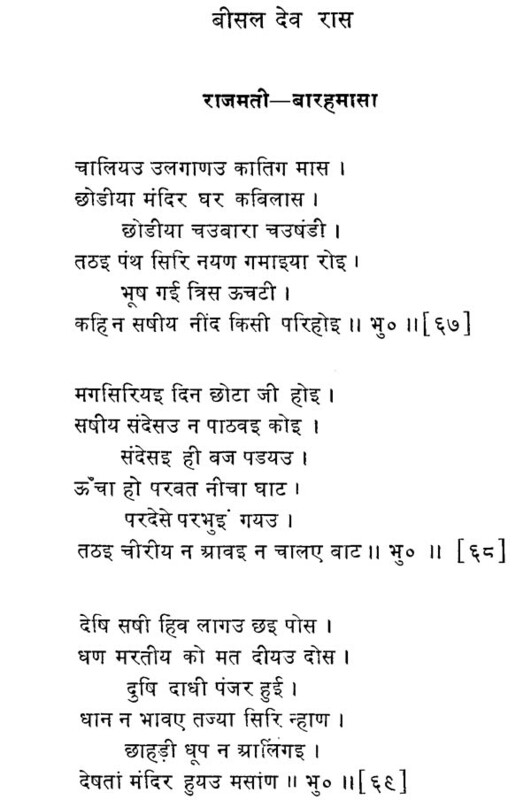 Muslim poets were no less fond of the Barahmasa genre as were Hindu poets, as exemplified by the Sufi literature known as "Hindi mathnavis" composed in the Avadhi dialect of eastern Hindi, from the 14th century onwards. The most ancient of these mathnavis, the Candayan of Mulla Daud, is based on an ancient Bhojpuri folk Epic known as "Lor-Canda", which depicts the adventures of the Ahir hero Lor or Lorik, claimed by the ardent love of two touching "virahinis", Maina and Canda, as Dhola, the hero of the Rajasthani Epic, is claimed by Malvani and Marvuni. 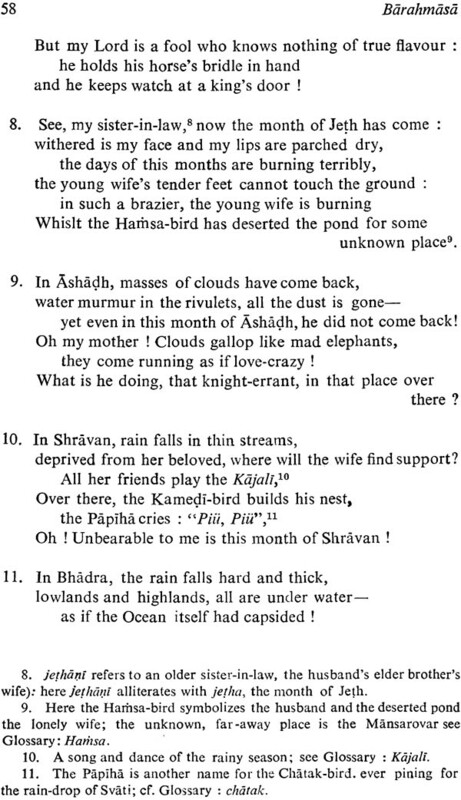 Contrary to the authors of the mangal-kavyas in Bengali, the Sufi authors in Avadhi had no use for didactic Barahmasas : they invariably stuck to the "Viraha—Barahmasa", sung by a lovelorn heroine; for medieval Sufi poets, as later for the poets of Krishnaite bhakti, "love in separation" (viraha-prema)— which they took as an equivalent of the Arabic word ‘ishq’— was the most perfect form of love, especially divine love, as it expressed the torments experienced by the created soul in its search for the divine Beloved. 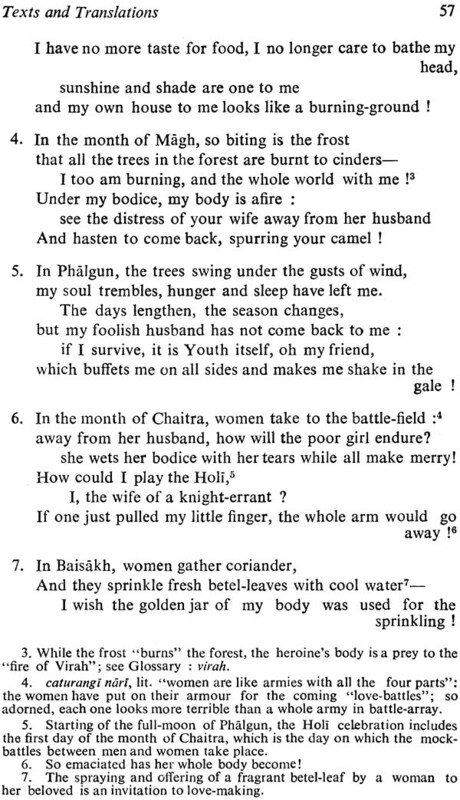 The fact that the Barahmasa genre was also used as a means of religious propaganda, first by Jaina monks and later by the "Sant" poets and the Sikh Gurus, could not but enhance its enduring prestige: the Barahmasa literature appears as the golden thread around which the souls of India’s villagers, from remote ages to this day, have woven the web of their joys and sorrows, especially the sorrows of women’s hearts-since the Viraha-Barahmasa remains originally and essentially the most perfect lyrical expression of the village women of northern India.